The Garden Apartment takes up the ground floor of Casa Pipistrelli. The living room, with its beamed ceilings and tiled floors, has a large open fireplace. It leads to a garden on one side and a secluded patio on the other. The patio, with a beautiful view over the hills, is a delightful place to eat, shaded by a vine, or to relax in the sun in reclining garden chairs. The apartment has a double bedroom, which also has access to the garden: bathroom with shower. The kitchen leads to the livng room and dining area and has a gas cooker, fridge and sink and all necessary utensils. There is the option of a second double or twin bedroom with its own entrance, making an ideal accommodation for four people.This bedroom is in the house above the main apartment and has its own en suite bathroom (shower). There is an extra cost for additional bedroom. The apartment is lovely in the summer with its patio and garden, but equally in the winter with the fire place and oil fired central heating. The two apartments are located in Casa Pipistrelli, one of the houses that forms the peaceful hillside hamlet of Peralta which is situated on a south facing hillside above the valley of Camaiore. The GARDEN APARTMENT takes up the ground floor of Casa Pipistrelli and, as its name suggests, is surrounded by garden: at the back is a paved patio and in the front a shady, grass garden, particularly appreciated on a hot summer day. Both the patio and the front garden have a table so you can choose where to eat! There is a barbecue and garden lounger chairs. The living room opens both back and front onto the garden and has an open fireplace for cosy winter evenings. The double bedroom opens onto the front garden and is cool on hot summer nights. The kitchen is well equipped, and there is a bathroom with shower. The TERRACE APARTMENT takes up the third (top floor) of Casa Pipistrelli. Its entrance is from a path the back of the house. The views over the valley are panoramic and the large terrace is accessed from the back of the apartment. The terrace also has lovely views and is very private. Olive trees provide shade but the terrace is large and so there is also a place to find full sun if you prefer. Sun beds, a dining table and lots of peace and quiet to be found here. Double bedroom; bathroom with shower; dressing area; large living room with kitchenette at one end. Good central heating in the cold months makes it ideal for winter as well as summer lets. Both apartments have central heating and are very comfortable in winter. Long lets in the winter are possible at very reasonable rates. There is a shared swimming pool on one of the upper terraces, a tranquil spot with a panoramic view towards the sea. PERALTA, with medieval origins, was restored over a period of thirty years with love and imagination by international sculptor Fiore de Henriquez. She created a place that is quite unique. Its commanding position gives Peralta stunning panoramic views over the valley to the sea beyond. Terraces of olive groves, orange and lemon trees, bougainvillea, jasmine covering the stone walls makes the hamlet seem like paradise. Fiore’s sculpture and the manner in which she designed and restored Peralta, give the place its very special character and atmosphere. 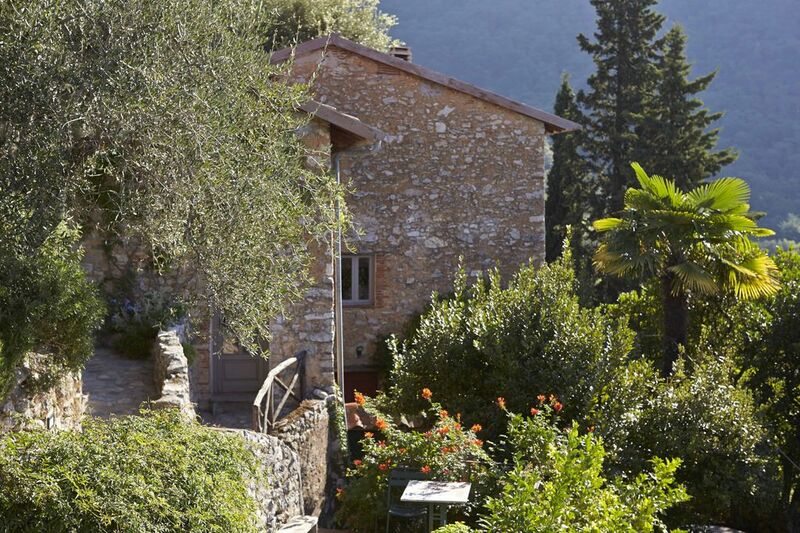 Perfect base for a holiday, far from busy crowds and yet with easy access to all main Tuscany attractions. The town of Camaiore is a ten minute car drive away. It is lovely to return to the peace of Peralta after a busy day. Peralta has various self catering accommodation located in different houses, lots of shady olive terrace with the large terrace in front of Peralta being a lovely place to sit with a glass of wine, enjoy the sunsets and meet other guests. ART AT PERALTA: As well as for guests who simply wish to relax and enjoy their surroundings and the pool, Peralta also offers an ideal, inspiring setting for creative people: painting, sculpting, writing. Writers can settle in and write in peace. Lovely walking country with marked trails through the olive groves and hills dense with chestnut trees and known for their wild flowers in spring and autumn. Walks range from 50 minutes to a delightful restaurant in an adjoining village, to three hours up to the peak of the Mount Prana above Peralta. GROUPS/RETREATS/REUNIONS AT PERALTA Imagine having 18 bedrooms at your disposal for a wonderful weekend family party, for a wedding, or just a reunion of old friends. Contact us for more info or see our website. International sculptor Fiore de Henriquez was living in the area of Camaiore from the 1960's due to its proximity to the Carrara marble quarries and the bronze foundries of nearby Pietrasanta. In the 1970's she found the small hamlet of Peralta, perched on the hillside above Camaiore. It was remote, served only by a footpath, and the buildings were mainly in ruins - their inhabitants having left in the mid 1950's due to the hard living in the hills. No water nor electricity at this time. Fiore fell in love with the hamlet and managed to gradually buy the various houses. She then set about restoring them and the hamlet and created the very unique place that exists today. She died in 2004 and the hamlet was then taken over by a very good friend of her's who is the current owner. . Repairs and renovations are undertaken where necessary, but the essential essence of the hamlet remains the same as when Fiore was alive. It is the home of her archive and sculptures, which can be seen throughout the grounds and in the various accommodation. Efficient central heating in all rooms from oil fired boiler. The washing machine is for the use of several apartments. We supply detergent. Large area for hanging out washing. Large fireplace for burning logs, supplied by us. Roaring fire lovely to sit beside in winter months. We provide a coffee press and an Italian style expresso perculator. The kitchen is open plan to the living & dining area and has easy access to the large terrace, which is for the sole use of the apartment. There is a television in our bar for everyone's use. Summer only. The apartment is surrounded by its own garden area, part of which is a large paved terrace, with shade, and a lovely view of the hills covered with chestnut trees. There is a washing machine for shared use between three apartments. There is a computer for shared use of all our guests. There is a very strong wifi signal. The main Peralta terrace is a great place to bring your bottle of wine, meet other guests, sit and enjoy the view over the valley to the sea. The sunsets are magnificent. Peralta is a hillside group of houses situated in the northern part of Tuscany, on the slopes of the Alpi Apuane National Park, 10 minutes from the market town of Camaiore which, in turn, is 10 minutes inland from the coast Lucca is a 35 minute drive to the south. Motorway exit is 20 mins, making day trips easy: Siena (2 hrs), Carrara & its marble mines (45 mins). You can drive into the Carrara mountains - or go to the beach - the closest is Viareggio, the most popular Forte dei Marmi (35 mins). The Cinque Terre are one hour away - one can drive to La Spezia or Porto Venere and visit them by boat - the ferry service is frequent..Shopping in the area (Lucca/Florence/Forte dei Marmi) is legendary! The sculptors' town of Pietrasanta is only 20 minutes away. Peralta is Ideally situated for the Puccini Festival (40 minutes away). - open air opera Festival taking place in July and August at Torre del Lago. ACCESS: Airports: Pisa 45 mins - Florence 1 hr. Genoa 1 hr.40mins - Bologna 2hrs. From the A11 and A12 motorway exit, Viareggio/Camaiore, you head for ''Viareggio' and then 'Camaiore'. We give detailed directions. Note: The last 200 or so yards of our road are very steep and narrow with 2 hairpin bends. A smallish car is recommended, although an Espace & other large cars can make it. The road comes to an end in our car park. From there you walk to Peralta itself (about 200 yards/meter). Larger cars can park below the final steep ascent - we will bring your luggage etc up to Peralta in our tri-porter vehicle (Ape). It is an easy walk from the lower parking area to Peralta.